Jerusalem - Giro d'Italia organisers said Thursday they removed references to "west Jerusalem" for next year's cycling race, after Israel threatened to drop an agreement to host the start of the event. 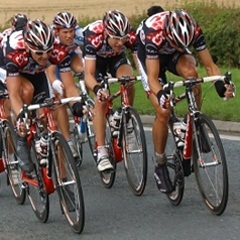 The organisers of the prestigious cycling event noted the race would begin with a time trial in "west Jerusalem" when announcing the routes on Wednesday. Israeli officials in response threatened to drop their partnership with the Giro. Israel sees all of Jerusalem as its undivided capital, while the Palestinians see the eastern sector of the city as the capital of their future state. The international community says Jerusalem's status must be negotiated between the parties, with foreign embassies to Israel currently located in the country's commercial capital, Tel Aviv. "During the presentation of the 2018 race course, technical material containing the wording 'West Jerusalem' was used, due to the fact that the race will take place logistically in that area of the city," Giro organisers said in a statement. "That particular wording, devoid of any political value, has been removed from any material related to the Giro d'Italia." Jerusalem would be used instead, it said. Race organisers declined to comment further. Israeli officials welcomed the decision. "Following our appeal to the Giro d'Italia management, we are pleased with their quick decision to remove the caption 'west Jerusalem' from the official publications of the race organisers," Sport Minister Miri Regev and Tourism Minister Yariv Levin said in a joint statement. In addition to the Jerusalem time trial, the following two opening stages of next year's Giro will take place in Israel. It will mark the first time one of cycling's three major races will begin outside Europe. The other two stages will follow the Mediterranean coast from Haifa to Tel Aviv and begin in Beersheba in the Negev desert and end in Eilat on the Red Sea.